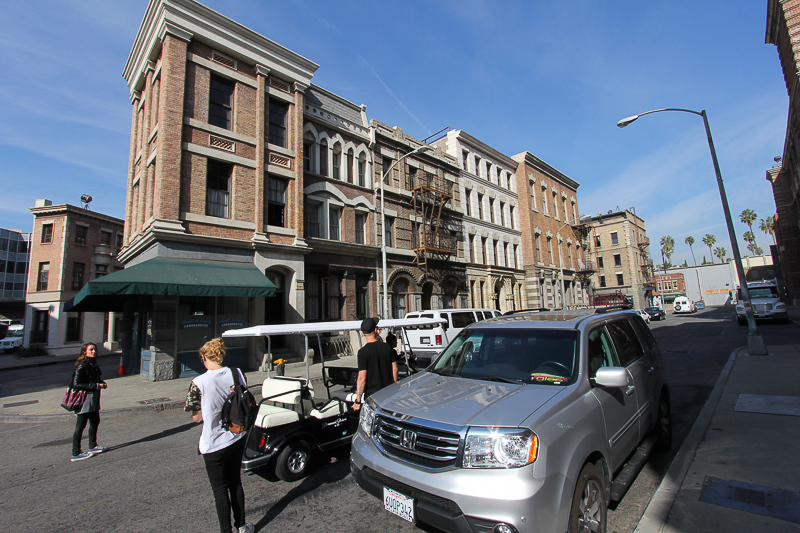 January 29, 2014 - Today's adventure brought us to Hollywood to visit the Paramount Pictures Studios. 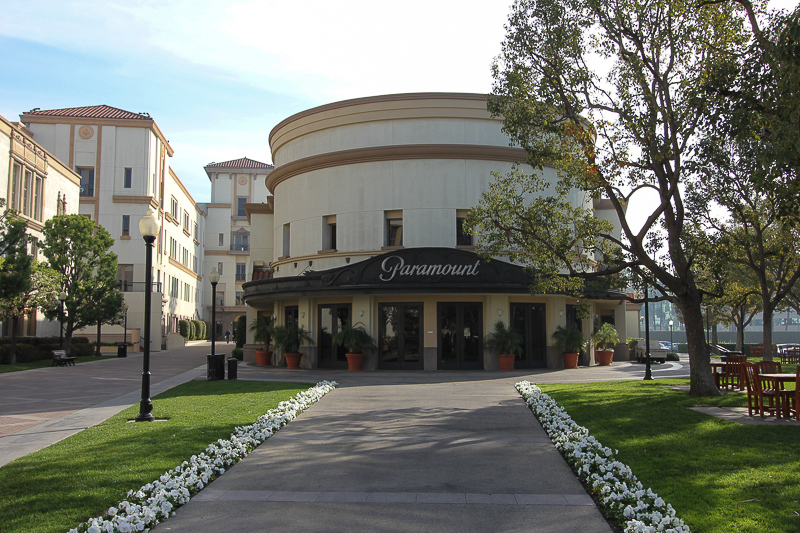 Paramount is the fifth oldest surviving film studio in the world behind Universal Studios, Nordisk Film, Pathé, and Gaumont Film Company. 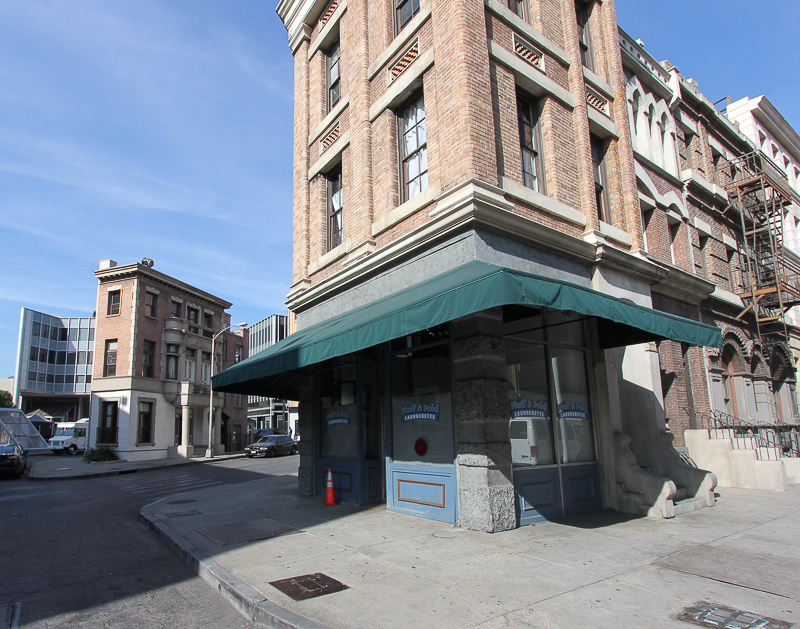 However, it is the last major film studio still headquartered in the Hollywood district of Los Angeles. 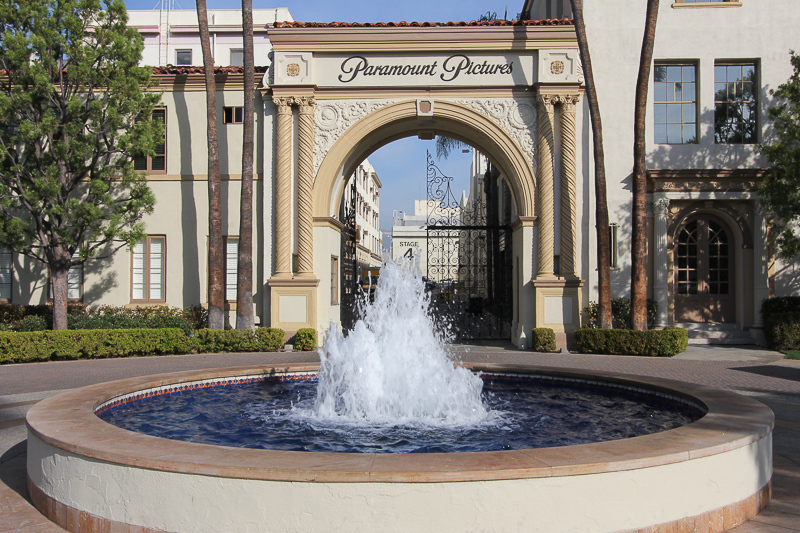 Paramount Pictures dates its existence from the 1912 founding date of the Famous Players Film Company by Hungarian-born Adolph Zukor. 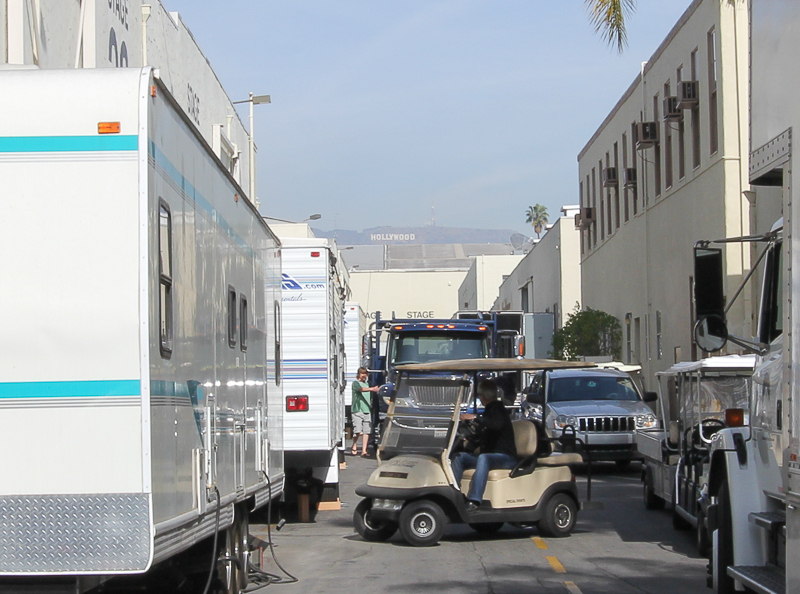 The studio lot is currently 65 acres and has thirty stages. We entered the lot through the more recent Melrose Gate. The original gate before the lot was expanded was the Bronson Gate, which is especially beautiful. 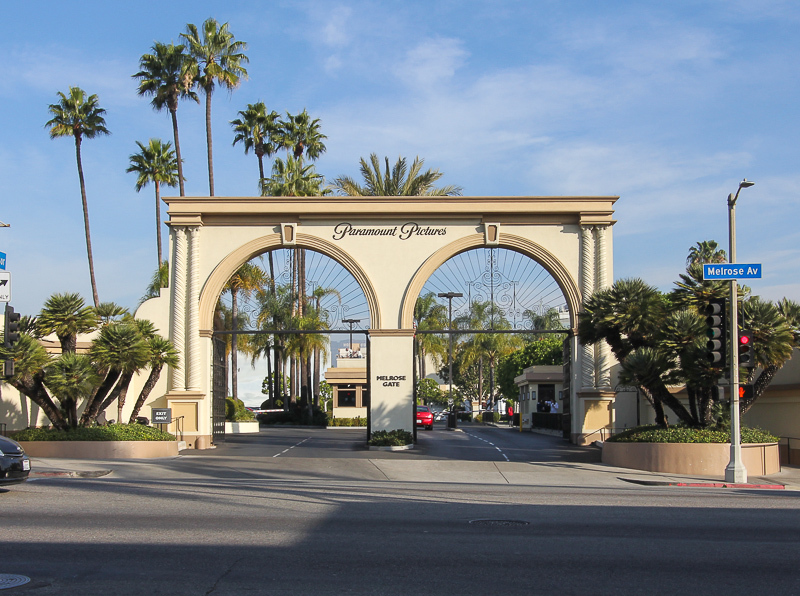 This gate appears in many early Paramount films. 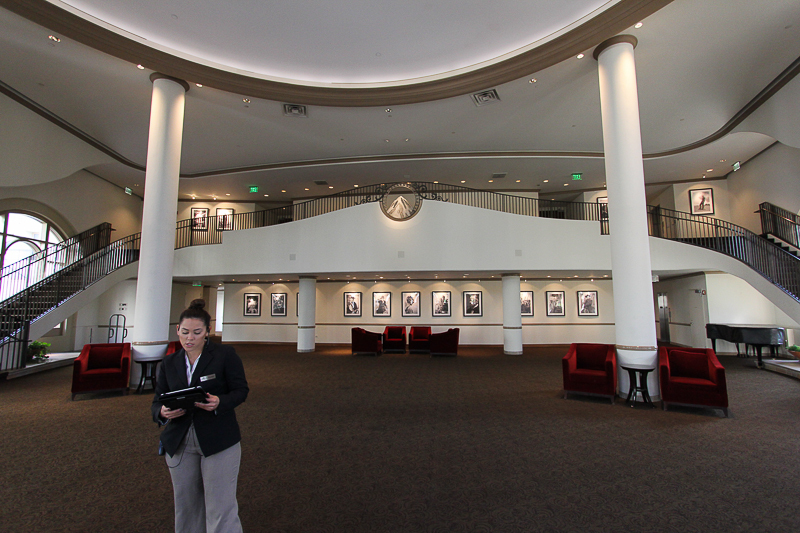 This is the largest screening theater on the property, which holds about 500 guests. 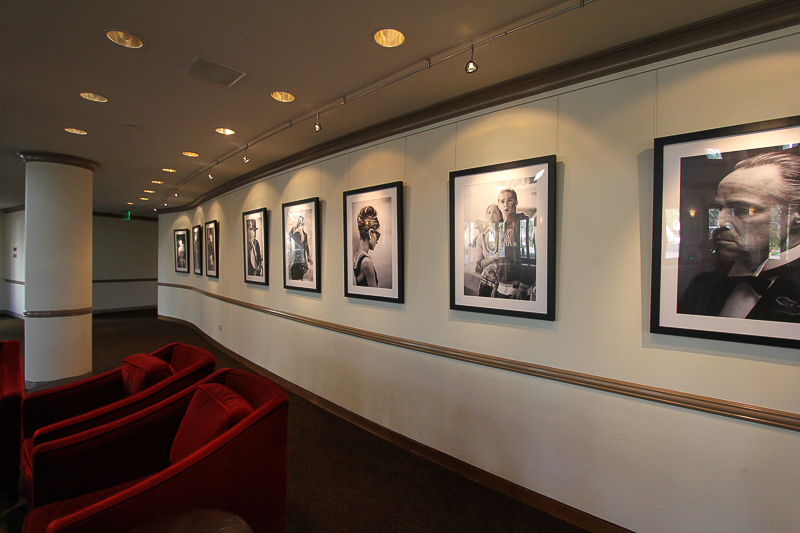 This is the lobby, which also doubles as a studio set. Our tour guide, Jocelyn, did a great job throughout the tour. 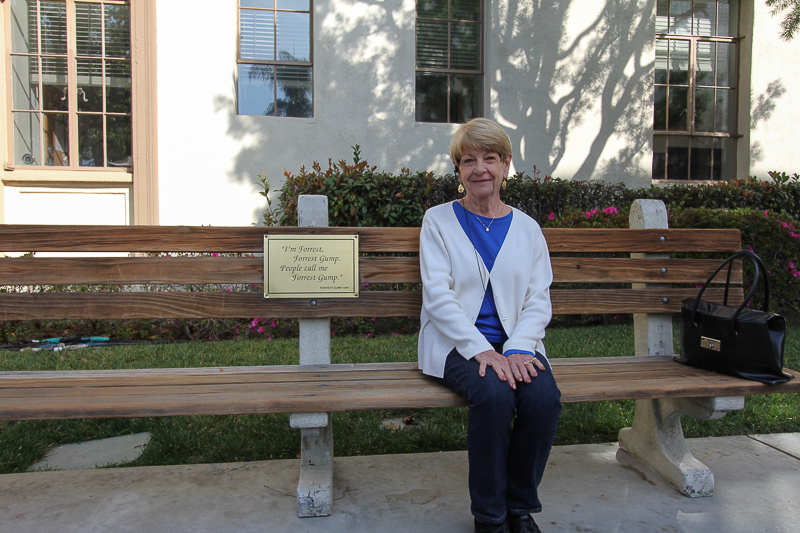 Judy is sitting on the original bench used in the film "Forrest Gump." The interesting thing about the bench is that the seat back is 90 degrees to the seat, so slouching isn't possible. Forrest's posture in the movie was always erect and straight up. 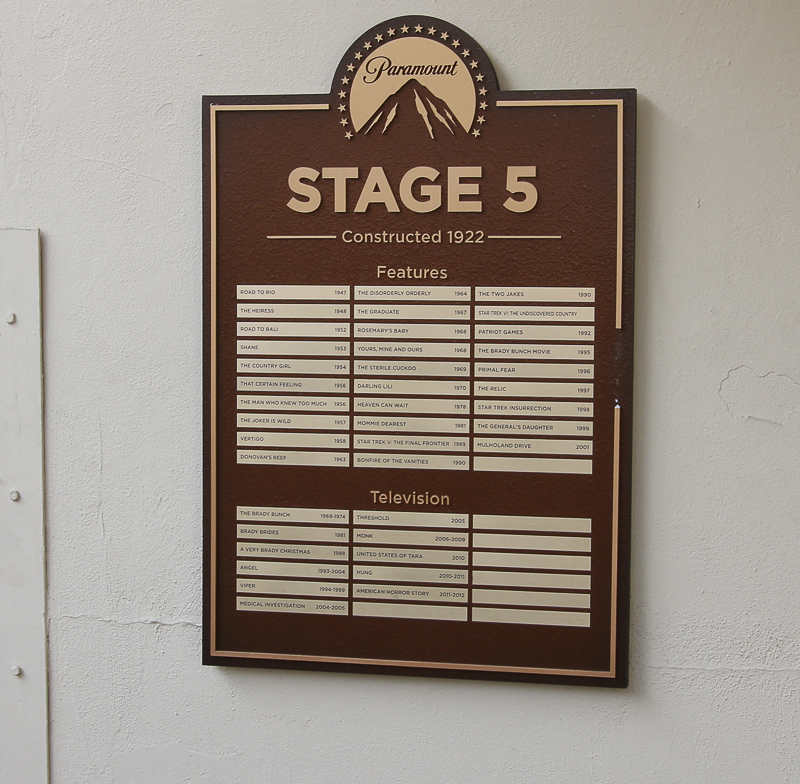 This placard on Stage 5 lists the movies and television shows shot at this location. Every stage has a placard like this so we were surprised by the number of movies that we've seen that were shot here at Stage 5 and at the other stages on the lot. Check the list of feature films shot at just this one location. The Paramount water tower overlooks what's called the "Blue Sky" lot. 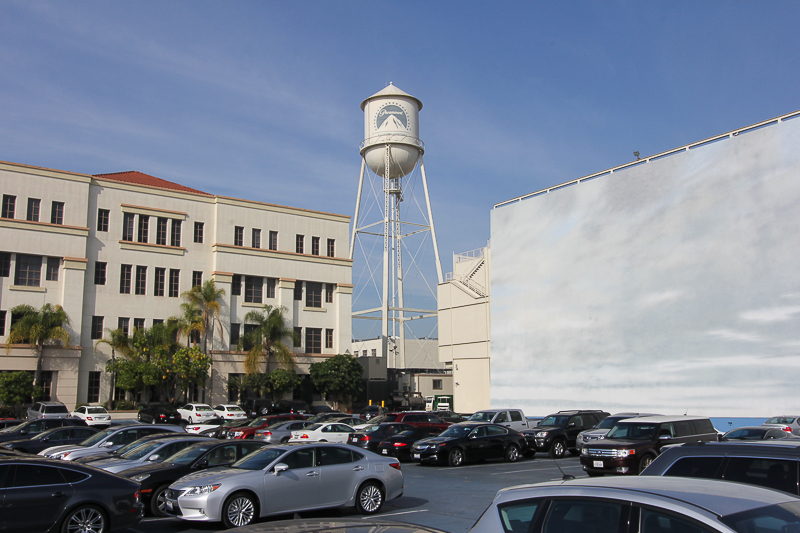 The large mural on the right has been used as a sky background in dozens of movies. It is frequently re-painted to create the right feel of the scene being shot. The cars are parked on a parking lot that's painted blue. When needed, the cars are moved, the parking is cleaned up and then flooded for ocean or other water scenes. This is where Charlton Heston parted the sea for the movie "The Ten Commandments." One whole section of the lot is a re-creation of New York City's various neighborhoods (Greenwich Village, Brooklyn, Upper East Side, Washington Square, SoHo, Brownstones and the Financial District). Right after leaving the exterior New York set, we had our only movie star sighting of the day. Our tram buzzed by Jennifer Aniston as she got out of a car and starting hugging someone. It was over in a flash, so I wasn't able to get a picture since Jocelyn drove our tram at a good clip. 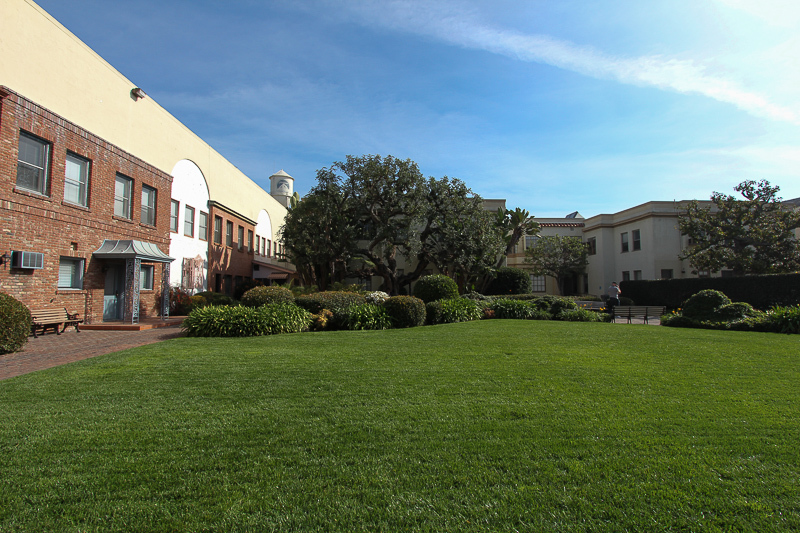 Half of the existing Paramount Lot was originally the studio lot of RKO Pictures and the RKO lot was subsequently sold to Desilu Productions, owned by Lucille Ball and Desi Arnaz. Lucy decorated the grounds in front of her offices to match the back yard of her homes in Beverly Hills and Jamestown, NY. The entrance to her office was under the blue canopy on the left. 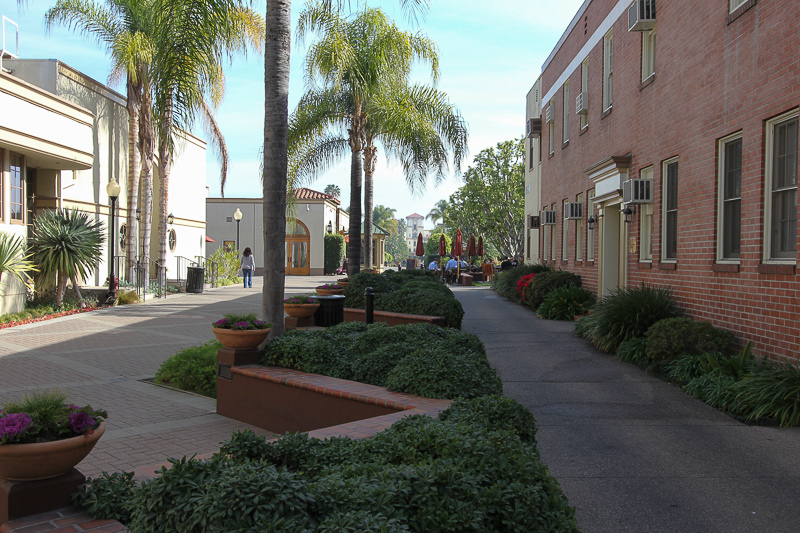 The grounds are very well maintained and create a relaxed work environment. However, this shot shows the controlled chaos of film and television production while displaying the iconic Hollywood sign in the distance. After the tour, we went to Il Forno Caldo for lunch in Beverly Hills. Judy had the penne pasta with pink vodka sauce and I had their linguini with clams. Buon Appetito!